Julian Gollop is playing Chaos Reborn, and he’s losing. Badly. 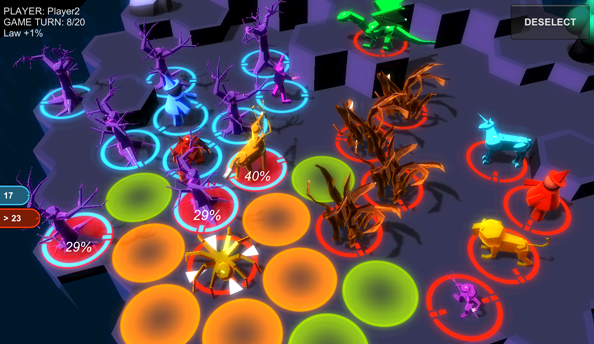 His wizard, both player avatar and font of all spells in this turn-based game of spellcasting, is backed into a hexagonal corner of the map – a charcoal island arena interrupted by jutting rocks and dotted with leafless trees. With an impotent fizz-crackle, his would-be spider goes the same way as a potential unicorn, an intended giant, and a whole host of sentient, violent flora that never quite materialised. As our eagle and scorpion close in on his position in a pincer movement of Gollop’s own advising, you might even be tempted to feel sorry for him – but you shouldn’t. It’s sort of his fault. Let us not forget: this man has been driven all his professional life to create strategy games in which every shot, swipe and grenade toss hinges not just on player intent, but on the fickle roll of the dice. Here’s the thing: Julian Gollop cannot help but make these games. It’s this fact which has driven him to leave security at Ubisoft for unbound creativity, and to roll the dice on the goodwill of X-Com fans on Kickstarter. Julian Gollop has spent more than six years of the last decade at Ubisoft Sofia – at the time of his joining, a gaggle of handheld game specialists with a fraction of the “power and political weight” of some of the publisher’s better known city states. In those first years, Gollop worked on several DS projects for Ubisoft – most of which were cancelled. Increasingly creatively frustrated, the X-Com designer was eventually driven to invoke his own legacy, so that Ubisoft Sofia could work on an idea that was entirely their own – and that might stand a chance of weathering the publisher’s internal pitch process. Browsing the publisher’s IP catalogue for a likely turn-based strategy vehicle, Gollop happened upon Ghost Recon – the nominally tactical shooter series the publisher was then rebooting as Future Soldier. As it happened, Future Soldier for the big machines was delayed and rehashed by an entirely different team – and Sofia were given the rare instruction to go their own way. 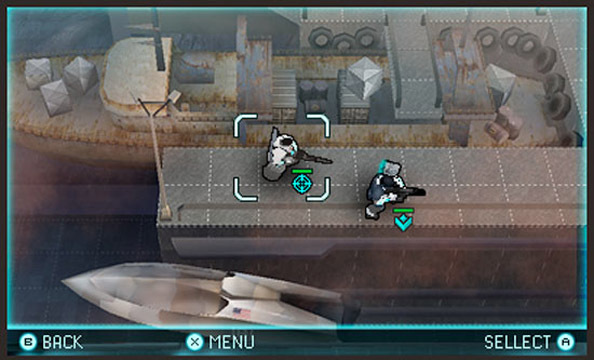 The resulting turn-based tactics game was a bullish, often brilliant, X-Com variant Gollop describes as his “main achievement” at Ubisoft. But he doesn’t think he could have pulled off the same trick for Chaos Reborn. “You don’t get a lot of freedom and [you get] lots of interference,” he says of his time at the publisher. “So how Capybara got away with [inventive match-three RPG] Might & Magic: Clash of Heroes I don’t know. And so Julian Gollop went indie – and not for the first time. 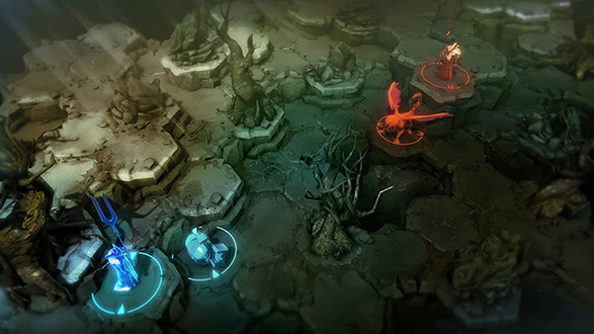 Over the past year, Gollop has sat at home – down one Spectrum, up a Twitter account – and built a multiplayer browser prototype for a game named Chaos Reborn. You can play it yourself, if you like. While its placeholder menu sounds are sourced from the original X-Com, and missing animations can make individual moves hard to parse, it’s already a tense and tactical game of chance and consequence. Games Workshop published the original Chaos before Warhammer reached its second edition – and the two games share a willingness to let explosive bad luck trump careful planning. 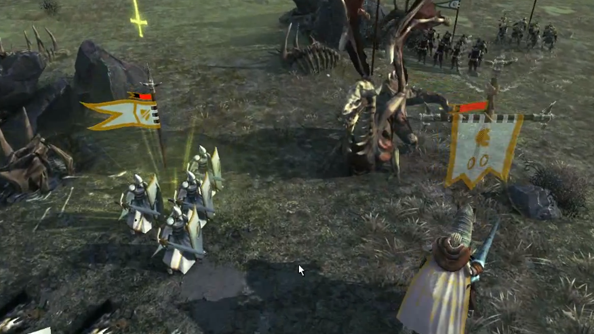 Just as a swarm of Skaven can scarper off the battlefield at an inopportune moment, a 15%-to-hit swipe from an ambitious eagle in Chaos can finish off the PC’s greatest proponent of turn-based tactics games. 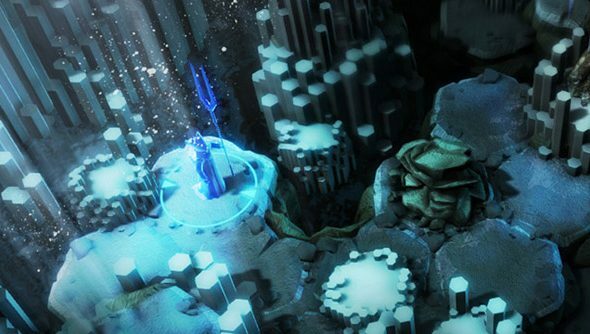 In fact, the whole affair is lent an air of vulnerability – thanks the fact that each player controls their wizard as a tangible, pointy-hatted presence, rather than an omnipotent camera positioned somewhere above the board. Power in Chaos is a teetering, nebulous thing you’ll be wary of celebrating – not least because of its centrepiece spell. 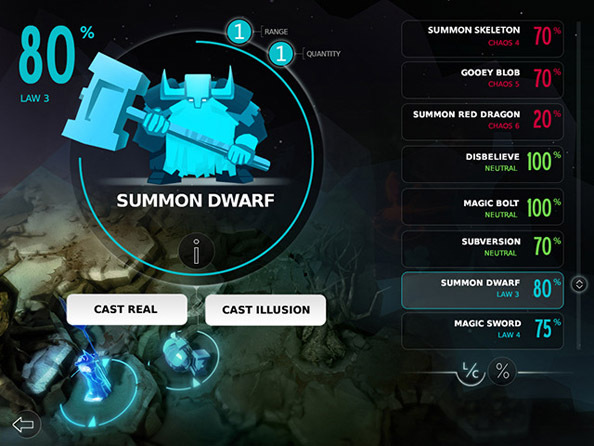 Players can bypass the percentage chance to cast altogether by summoning a minion as a fully-functioning, damage-dealing illusion. And their opponent can waft it away it just as quickly by risking their turn on a Disbelieve spell. It turns out Chaos Reborn’s high-level game is Poker – played out between throwbacks to the dummy tanks deployed during World War 1. That, and the ever-present chance of horrible failure, makes it eminently replayable – and a planned single player mode will only make it more so. 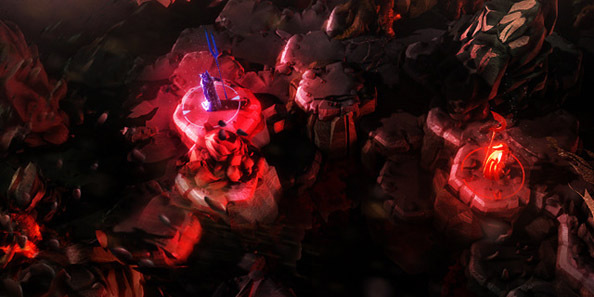 For single player, Gollop and his team plan to expand on the arena battles with an RPG metagame concept. Players will be tasked simply with defeating a Wizard King – but will need to defeat his minions, the Wizard Lords, first. In the process, they’ll explore a procedurally-generated realm, picking up new types of equipment and interacting with NPCs – also procedurally-generated. Needless to say, there’ll be some tricky maths involved in its development. The realm overworld will provide no respite from the hexes. Its 3D landscape will be made up of six-sided shapes, each housing a mountain, town or other point of interest. They’ll need to be uncovered via intrepid exploration into the game’s fog of war. “It’s a sort of RPG/adventure quest system which sounds rather complicated but the meat of it is all in the tactical combat and the business of the AI you’ll be fighting,” explains Gollop. This is the most exciting bit. As players travel through the realm, the Wizard King will grow stronger – reinforcing his position with additional spells and minions. Left to his own devices, he’ll eventually muster a banishing spell powerful enough to kick you off the map altogether. 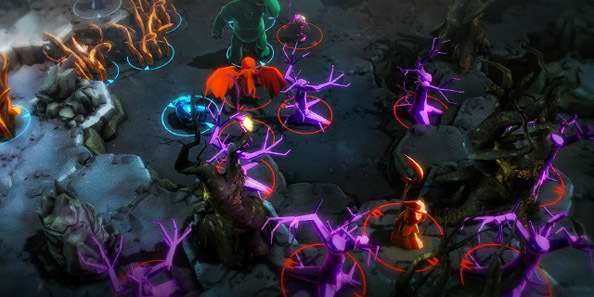 Those wondering precisely what shape Chaos’ overworld landscape might take should look to the “bloody good” Age of Wonders 3: the great contemporary turn-based strategy game that – like Chaos Reborn – adds new turrets onto its legacy rather than cashes it in. “It’s a marvellous game, as long as you take its limitations without being too critical,” gushes Gollop, without prompting. “It’s got these elements of Civilization in it with the buildings and the cities and the settlers, but really the game is much more about the battles, which are very well done. And the cities are just like factories and that’s really the way it works, you don’t have to manage them in any way. Gollop may be happy that Age of Wonders exists, as he is The Banner Saga and the rebooted XCOM. But it’s not exactly the ideal zeitgeist for his Kickstarter campaign – the most successful of which have all capitalised on a dearth of similar prospects. At the time of writing, Chaos Reborn’s coffers are recovering from a mid-campaign slump which, we reassure him, is fast becoming the norm. But we’re not sure that’s true. Remember: this man has consistently made games that eschew the measured precision of a Hearthstone or Card Hunter for, essentially, chaos – random chance, and the unpredictable, unforgettable moments that sometimes emerge as a result. Who has left a steady but unfulfilling job as a producer at Ubisoft for another chance at those highs, knowing that they might just as easily be lows. Julian Gollop, we suspect, will never be able to resist another roll of the dice.